It's not really gambling when you never lose. Can't make it to your local casino? Big Fish Games brings home the virtual gambling action in Big Fish Casino. Big Fish Casino gives you the chance to win big in Slots, Blackjack, Texas Hold'em Poker, Craps, Roulette and more. We're going to give you a few tips and strategies to get rolling in virtual currency. How do I play Big Fish Casino? First, you want to collect the free chips that you get regularly so you can have more currency to play with. Select the Collect Chips button to get free chips every 30 minutes. Once you've collected your chips, a meter will appear indicating when you can collect more. Going to the Reward Center will allow you to use tickets to win chips and gold. Buying Chips and Gold will earn you tickets for the mini-games. You can also earn tickets when you level up. Clicking on the Challenges button gives you tasks to complete. Completing these challenges will earn chips and experience. Selecting the different games from the lobby will take you to that game's staging area. How do I get started in Big Fish Casino? Once you select your game within the Lobby area, you'll enter the staging area where you'll have several rooms to choose from. Each game has a minimum bet or buy-in. If you do not have the minimum, you cannot enter the room. 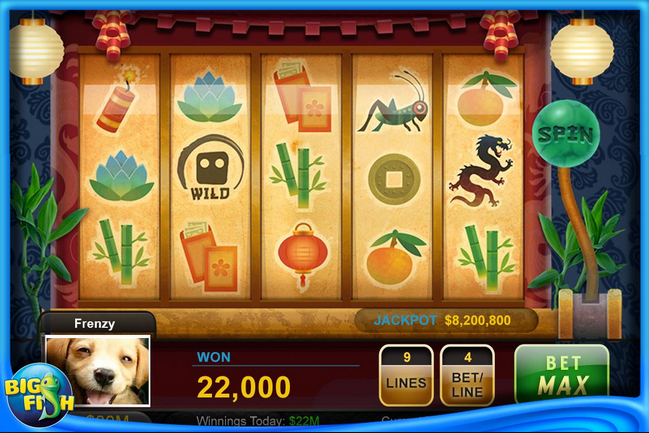 The purpose of the game is to win and win big in this virtual casino. Log in daily to Big Fish Casino to play the random game of the day and win a predetermined chip amount. You want to acquire as many chips as possible to place larger bets in the hope of winning greater rewards. Connect the game to Facebook and receive an additional 1,000 chips per friend up to 25k chips. Signing in daily will grant you a chip bonus (max 25k). Logging in every 30 minutes or four hours will give you free chips. Linking the game to your email address, Facebook and Twitter accounts will increase the amount of goodies you earn. You can also earn free chips by watching a video or completing a promotional offer. How many games are there in Big Fish Casino? There are approximately eight games you can choose from in Big Fish Casino. Play Slots, Blackjack, Texas Hold'em Poker, Video Poker, Craps, Roulette, Bingo (Speed and regular) and a few mini-games. There are a few ways to get bonuses within the game. XP and multi-hour chip boosts are permanent and included with most purchases in the chips store. Your total boost will equal the highest boost percentage purchased; boosts do not combine. Power-ups are temporary and will increase the likelihood of receiving a bonus. They can be purchased with gold from the Gift Shop. Playing the games will earn you experience points. You can also earn XP by giving gifts and winning games. Gaining XP and leveling up earns you new titles, opens doors to higher-stakes games, unlocks new gifts and chip packages for purchase. Increase the rate at which you earn XP permanently by purchasing chips in the store. As you level up and unlock new items, you'll receive an in-game message notifying you of your progress. How do I play with friends in Big Fish Casino? If you would like to compete against friends in the game, go to your friend page by selecting the friends icon. A number will indicate how many friend requests you have. You can also see your current friends listed on the page. Lightly shaded icons indicate they're not online. Adding a friend is easy if you know your friend's code. Select the Add Friend button and enter their code. If you don't have their code, you can always search for them by selecting the Find Friends or Invite Friends buttons to connect to your social networks to send invites to play. You can also select an avatar and choose the Add Friend button to add them to your friends list. Does Big Fish Casino cost anything to play? The game is free-to-play but there are micro-transactions for Chips, Gold and Tickets to help you fund your virtual bankroll. You now have a few tips and strategies for getting started in Big Fish Casino. Check out our Black Jack Cheats and Tips guide. It will give you some tips and strategies for winning the game.